The Morrison Natural History Museum tells the story of the area’s dinosaur-laden geology and the dinosaur discoveries that put it on the map in 1877 and are continuing today. It’s a teaching museum where small groups of visitors are guided by staff members and are encouraged to touch valuable fossils in the 2,000 square feet of exhibit space in what used to be a rancher’s condemned cabin. The museum also conducts research, which led to the discovery in 2005 of tracks from dinosaur hatchlings that apparently come from a group of baby Stegosaurus and tracks from what appears to be a baby Apatosaurus. The museum’s biggest attractions are several vertebrae, parts of limbs and pieces of the famous plates from a Stegosaurus that were uncovered by Golden schoolteacher Arthur Lakes in the nearby Dinosaur Ridge. Lakes was the first to find bones from the Stegosaurus, and his discovery laid the groundwork for research by famed paleontologist Othniel Marsh of Yale University’s Peabody Museum that officially named and described the giant reptile with the unique plates down its back and spiked tail. The museum also has partial casts of the huge, plant-eating Apatosaurus, also first dug up by Lakes and named by Marsh in 1877, and the tracks discovered in 2005. 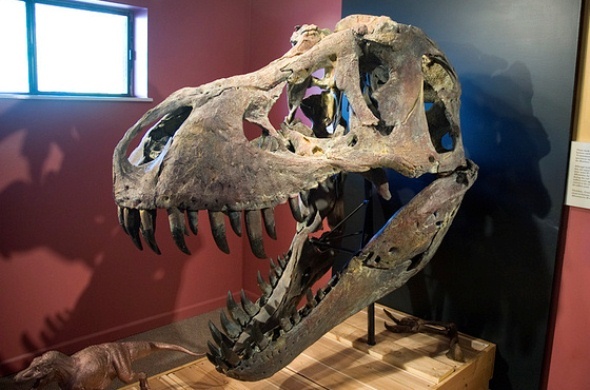 The collections also include partial casts of an Allosaurus and cast skulls from a Tyrannosaurus rex and a Triceratops, dinosaurs that have been found at other digs in the area. The museum features 19th century lithographs from Marsh’s scientific monographs and an area outdoors that explores the area’s geology, particularly the Morrison Foundation that was named for the town and became the source of dinosaur skeletons throughout the West. There also is a working laboratory that can be viewed by visitors.